Trumpeter Chet Baker was a significant presence in jazz during the 1950s and 1960s and today he remains one of the music's 'legends'. He was seen as an American 'idol' because of his looks and romantic recordings and during those two decades he played and recorded with other top American jazz musicians, but in the end, it was Europe that claimed him. 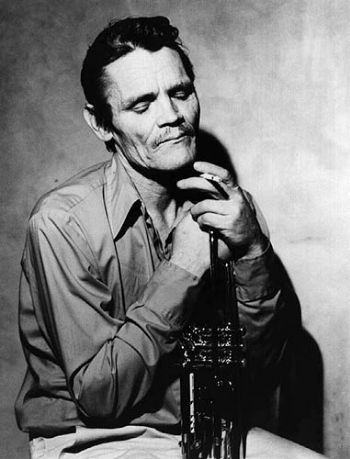 Chet was born in Oklahoma; his father was a professional guitar player and his mother a pianist. He sang in the church choir, took up the trombone and then switched to trumpet. His mother noted that he could memorise tunes on the radio and seemed to be a natural musician, making out tunes on the trumpet early in life. Chet left school at sixteen to join the United States Army where he joined the Army Band. After a short period studying music theory and harmony at El Camino College in Los Angeles, he re-joined the Sixth Army Band at the Presidio in San Francisco, playing at clubs until he was discharged to become a professional musician. 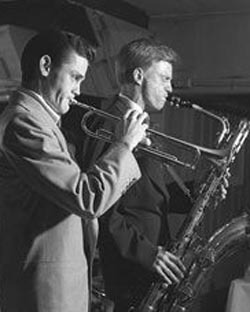 That career saw him playing with Vido Musso, Stan Getz and Charlie Parker until in 1952 he joined the Gerry Mulligan Quartet. The band's recording of My Funny Valentine became, more or less, Chet's 'signature tune'. He was also arrested and imprisoned for the first time on drug charges. Despite this, he went on to form his own Quartet, released albums and won readers' polls in Metronome and Down Beat magazines as well as being named the top jazz vocalist in 1954. Hollywood signed him to act in the 1955 movie Hell's Horizon (here is a brief clip from the movie), but his music was more important and he formed a Quintet with Francy Boland, where he played and sang. With all the promotion of his 'star' profile and his contribution to the cool sounds of West Coast Jazz, he became an icon. Chet admitted to starting taking heroin in 1957, others said it was earlier. Chet plays My Funny Valentine filmed in Tokyo many years later. 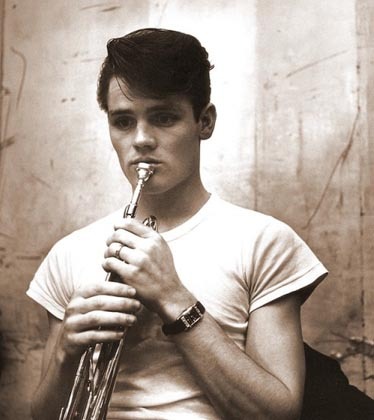 Chet's first introduction to Europe came with an eight-month tour in 1956 where he recorded the album Chet Baker in Europe. He returned to Europe in 1959 and recorded again in Italy the albums that are referred to as The Milano Sessions, although he was arrested again on drug charges and had to prepare some of the arrangements from prison. During the decade he was also expelled from Germany and the UK on drug-related offenses and was deported to the U.S. from Germany for getting into further trouble with the law a second time. He seemed to be falling out of favour in Europe and he returned California, performing in San Francisco and San Jose between jail terms for prescription fraud. His habit continued to undermine his work and particularly in 1966 when he was beaten up, and his embouchure damaged to a point where he found it difficult to play. Nevertheless, three months later, after getting used to false teeth and working on his playing, he found work in New York City playing and recording, in particular with guitarist Jim Hall. In the late 1970s, Chet returned again to Europe where his friend and lover Diane Vavra took care of his personal needs and helped him during his recording and performance dates. For the next ten years until his death in 1988, he would live and play almost exclusively in Europe, returning to America occasionally for a few performances. Interestingly his years in Europe resulted in many recordings, mostly for small European labels. 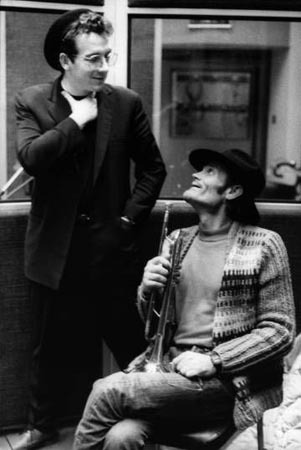 British singer Elvis Costello, who had been a fan of Chet Baker's for a long time hired the trumpeter to play a solo on his song Shipbuilding for Elvis's album 1983 Punch The Clock and that opened up a new audience for the trumpeter in the U.K.
Three years later in 1986, Chet was filmed with Elvis Costello and Van Morrison in a set of standards including Just Friends and My Ideal and entitled Chet Baker: Live at Ronnie Scott's London. Chet was not in good shape and he would die two years later, not in London, but in Amsterdam. He was found dead on the street below his hotel room with serious wounds to his head, apparently having fallen from the second floor window. Heroin and cocaine were found in his room and in his body. It is very worth watching the whole film but for a shorter clip, here is Send In The Clowns with Van Morrison taking the vocals. 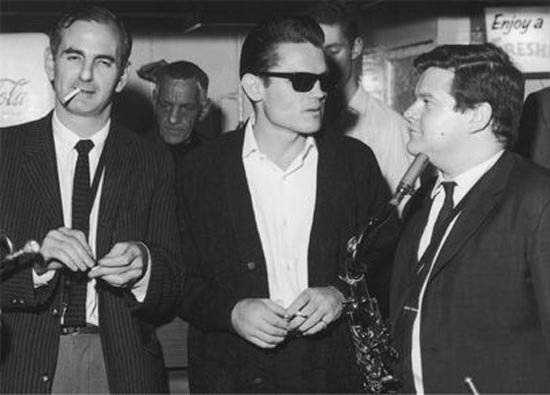 The full film of Chet Baker: Live at Ronnie Scott's (58 minutes) captures so much about Chet Baker at this time and includes Elvis Costello in conversation with Chet. Elvis Costello also wrote a beautiful song for Chet called Almost Blue that Chet went on to feature in many performances and which is also featured in the Chet Baker documentary movie Let's Get Lost. During the time Chet was in London in 1983 for the recording with Elvis Costello he was also captured on video and audio tape playing at The Canteen with a Trio led by pianist John Horler. We are able to see a video of Chet playing Broken Wing from the occasion. ......... and then isten to how the tune has been restored for the 2018 audio album. With Chet's permission, Jim Richardson who played bass on the set, recorded the session on a Sony cassette machine. The recordings did not see the light of day until three decades later when they were discovered and restored. They have been released on two albums, each with 2 CDs, on the Ubuntu label - Chet Baker Live In London Volumes I and II. The first appeared in October 2016, the second in August 2018. In his liner notes for the second Volume, journalist Richard Williams writes: 'The Canteen was a jazz club on the eastern fringe of Covent Garden: a narrow single-fronted space on the ground floor, backing on to a narrow alley. It functioned for probably not much more than a year in the early 1980s ..... presented there during its jazz incarnation were Ahmad Jamal, Slim Gaillard, Lee Konitz, Howard McGhee .... Chet Baker was playing as well as he had in the days of his youthful rise to fame in the 1950s, and sometimes even better. Those of us who were fortunate enough to hear him during that memorable engagement in Covent Garden already knew that. Now, in a set that ranges from his relaxed, swinging work on the jazz classic "Dear Old Stockholm" to the lyrical ballad treatment of "Polka Dots And Moonbeams", everyone can share the pleasure'. From the very first track, Strollin', there is no mistaking the sound of Chet Baker. On tracks where he sings, the voice is no longer what it was, but given what we know about the events that have taken place in his life, perhaps there is a certain poignancy in that; and given what we know, there is no question that the man's continued mastery of his instrument is amazing. John Horler's trio make for excellent companions, and although at times I find the piano a little 'bright', as you might expect, John Horler's solos sparkle. Writing in The Guardian, John Fordham said of Volume I: 'Live in London remains a compelling tribute to a flawed but inimitable jazz one-off'. Volume II completes this compelling tribute. At the time of writing, you can listen to Chet Baker Live In London Volume II. For details and samples of Volume I (click here) and Volume II (click here). Click here for our Tea Break conversation with Martin Hummel of Ubuntu Recordings.